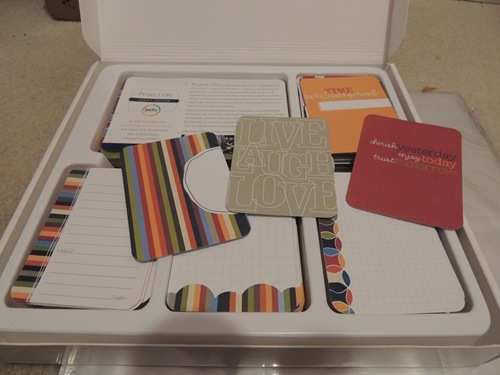 One of my 35 things to do before I turn 35 is to try Project Life. I used to be a scrapbooker. I scrapbooked my way through Gabbie’s 1st and 2nd years, but Zachary’s 1st year album was never finished (yes I do feel guilty). 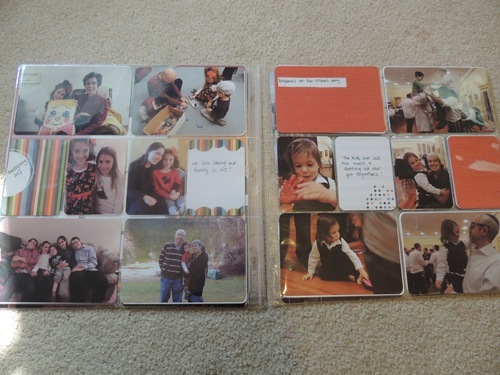 Project Life is a simple system for organizing photos in a pretty way but without the pressure of designing scrapbook layouts. 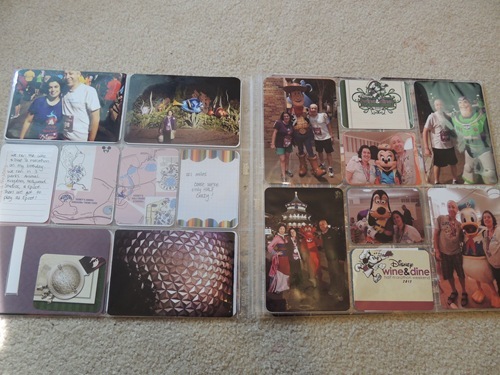 There is also no glue / tape involved because the pages have pockets to slide your photos into. 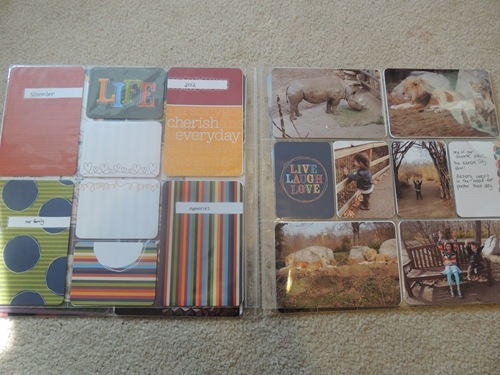 I ordered the Project Life Cobalt Edition Core Kit, as well as two sets of the photo pocket pages – horizontal and vertical. 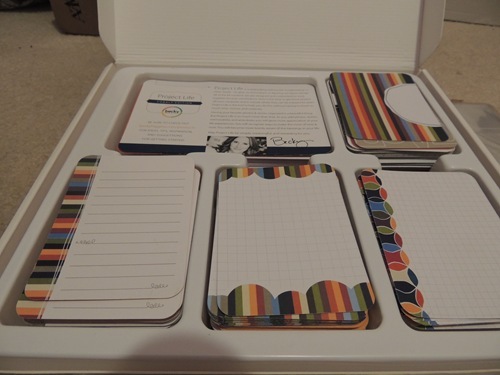 I originally wanted the multi pack but it was sold out, and I did not yet order the binder to put the pages into. I was thinking of starting with the beginning of 2012, but going back through all of my photos was a bit of a stressful thought. So I decided to start with last month. 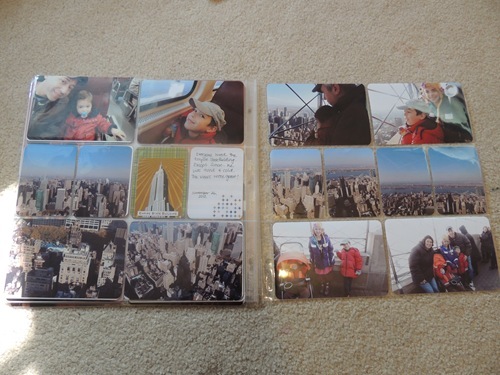 Walgreens had a 50 print free deal and I ordered – photos from Disney, the zoo, Thanksgiving, my nephew’s Bar Mitzvah, and the Empire State Building. The kit includes suggested papers for the cover page, so I started with that! I think something needs to be written in that big white spot on the top right but I’m not sure what! So Disney got two spreads. And then I faced my first problem. On the layout above, I used the photo pocket page meant for vertical pictures. But when I turned to the back of that page, I didn’t have any vertical pictures to use. 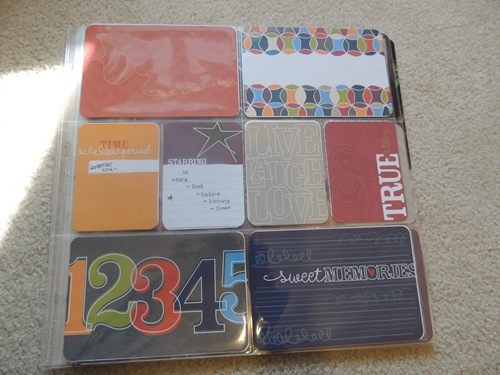 I filled the back with filler cards…I am not sure about this. 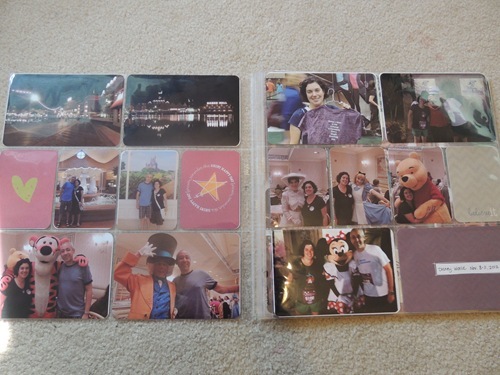 I will either have to stick with all horizontal pictures or make sure that when I do print vertical photos, I print enough for a front and back side. I didn’t really want to have to worry about what pictures I choose to print. I imagine most months shouldn’t have so many pages, but I guess it’s possible, since I do take a lot of photos! So far I am pleased, aside from the issue with vertical vs. horizontal photos. What do you think?